October 26, 2015 – NASA’s Dawn spacecraft fired up its ion engine on Friday, October 23, to begin its journey toward its fourth and final science orbit at dwarf planet Ceres. The spacecraft completed two months of observations from an altitude of 915 miles (1,470 kilometers) and transmitted extensive imagery and other data to Earth. Of particular interest to the Dawn team is Occator crater, home to Ceres’ bright spots. 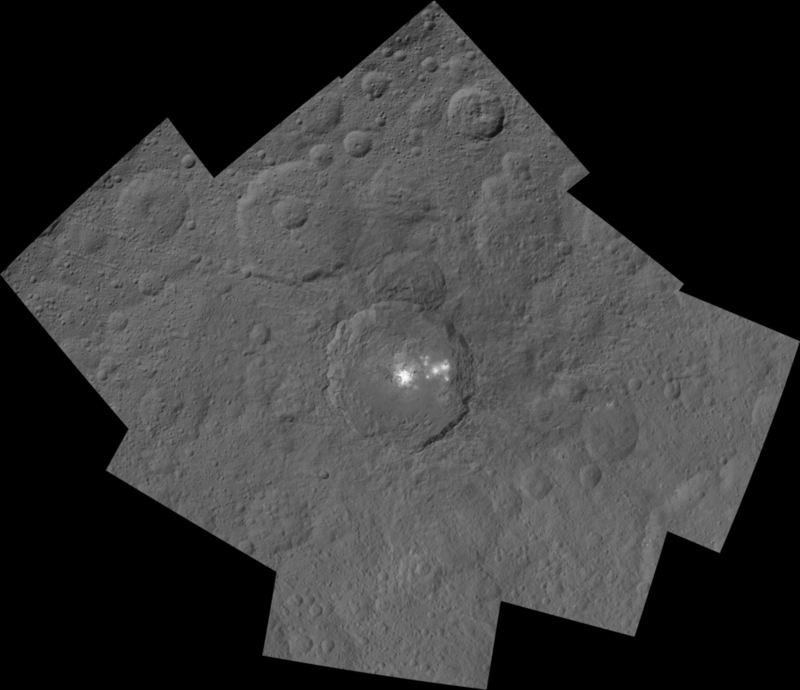 A new mosaic of images from Dawn’s third science orbit highlights the crater and surrounding terrain. The Dawn mission is managed by JPL for NASA’s Science Mission Directorate in Washington. Dawn is a project of the directorate’s Discovery Program, managed by NASA’s Marshall Space Flight Center in Huntsville, Alabama. UCLA is responsible for overall Dawn mission science. Orbital ATK Inc., in Dulles, Virginia, designed and built the spacecraft. The German Aerospace Center, Max Planck Institute for Solar System Research, the Italian Space Agency and the Italian National Astrophysical Institute are international partners on the mission team.